Awarded Release of the Year for 2012 by Mortgage Technology Magazine. 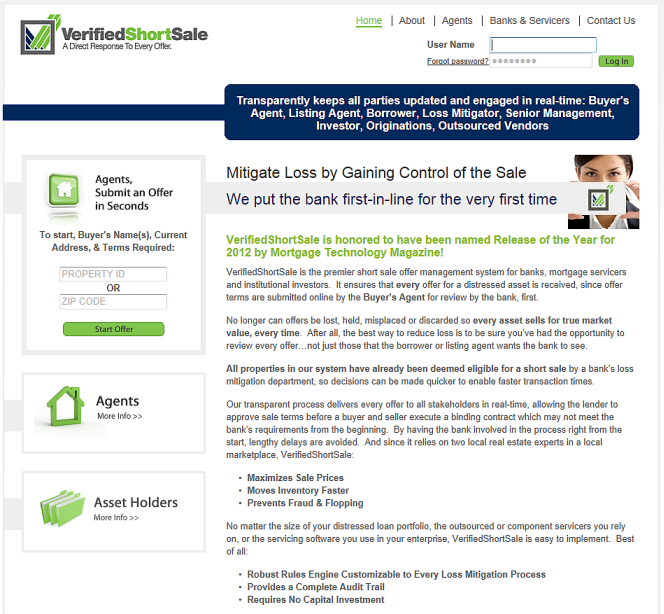 VerifiedShortSale is award-winning technology developed using the backbone and framework of OfferSubmission, ensuring buyer’s agents have an active role in the negotiation of a short sale property. For the first time banks and mortgage servicers are front and center with the control and insight they need to best execute and track the real estate side of their short sale transactions. The system prevents listing agent fraud, ensures borrowers are on board, and that buyers stay engaged through closing. It easily collects and stores all required documents and payoffs while keeping every stakeholder accountable and updated in real-time. Rather than being the last to know anything, the servicer is now first to know everything. Setup is simple and the system ensures complete compliance with internal or investor procedures and regulatory requirements. Best of all, it easily resolves valuation discrepancies by ensuring every bona fide offer in the local market is received for review. No longer will you question whether the BPO from last week or the appraisal from last month is more accurate…or whether the offer you’ve been sent for consideration is actually the best offer received; bona fide offers from the local market provide the best determination of value. And what the market says a property is worth right now is the most important value of all. Prevents Fraud For the first time, buyer’s agents are given an active role in the short sale negotiation process, ensuring that every offer is presented for servicer review. No longer can offers be lost, prioritized or discarded which means more offers for every asset. Maximizes Recovery More offers means more competition, which ultimately drives sale prices higher. VerifiedShortSale ensures every property sells for True Market Value. Improves Transparency Every stakeholder in the short sale including investor, servicer, loss mitigator, listing agent, borrower and buyer’s agent is engaged and accountable, with automated notifications and reminders to make sure that the expectations are met and issues are quickly resolved. Boosts Efficiency For the seller, make more informed decisions and process more sales than ever before. Receive and review documents as they’re uploaded in real-time. For the listing broker OfferSubmission eliminates redundant tasks and reduces status checks from buyer’s agents. Tired of low-ball offers that waste time and your precious human resources? Move them out of the pipeline with a click. Secure Environment VerifiedShortSale undergoes regular penetration testing, application vulnerability testing and is securely hosted on SSAE16 servers. The Transparent Control™ provided by VerifiedShortSale is the engine you need to win the race.